Want to find a great slot online? Conduct experiments involving earth, wind, and fire and gain scientific and online slot notoriety in this 5 reels high-octane adventure. Watch as the Avalanche meter soars and lights up as you match the ice crystal symbols. 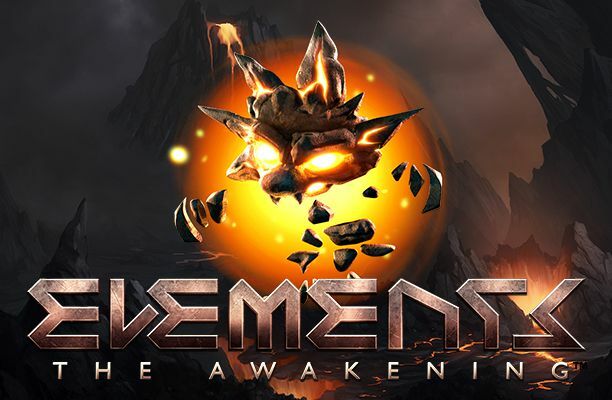 This online slot game is an intense adventure through the elements an absolute must if you're one of those science geeks who love a bit of action like me, this game is unique in the sense that there isn't too many like it out on the market. So if you want to get away from all the colourful cute-like slot games then this is it! Game developer NetEnt has been a leading provider for premium gaming solutions for over 20 years to some of the world’s most popular online casino operators. The team at NetEnt are a bunch of talented and experienced individuals that take pride in delivering the best gaming experience possible to their gamers. NetEnt has passed some terrific milestones in its history and has continued to dominate the online casino industry. NetEnt provides a range of games no matter what your style of gaming is from simplistic games to complex games. Look for Netent if you want to play slot games now! Fast forward in time to the future to a galaxy far away in this 5-reel 20 pay line slot game. The symbols used in Elements represent the four elements which are earth, water, fire and wind. The game comes with many features such as avalanche metre, wild symbols, free falls storm mode, free falls storm wilds, firestorm wilds, air wilds, earth storm wilds and water wilds. If you survive the 4 element storm you’re sure to get your hands on the prize. The metal box is the wild symbol in the game and substitutes for all other symbols. The wild symbol only appears in the main game. Symbols will explode and disappear allowing spaces for new symbols to move into when you get a winning combination. There is an Avalanche metre behind the spin button which will increase for each successive fall you get. Once you reach 4 crystals the Free Falls mode is triggered and it will take you to the bonus game round. The free fall storm wilds will substitute other symbols and create winning bet lines and pay the highest possible win on a betting line. The firestorm wilds will appear on reels 2, 3 and 4 and will turn 2 symbols next to each other into a wild. Once the air storm mode is activated 2 of them will randomly appear on the reels and stay there during the free falls rounds. They will move randomly ready for the next fall or avalanche. Earth storm wilds appear on reel 2, 3 and 4 and substitute other symbols. These act like sticky wilds and stay there until they form one or more winning bet line during 3 avalanches or until the wins are over. Water storm wilds are expanding wilds that cover reels and turn other symbols on the reels into wild symbols. Reels 2, 3 and 4 is the only place where you will see the Water storm wilds. 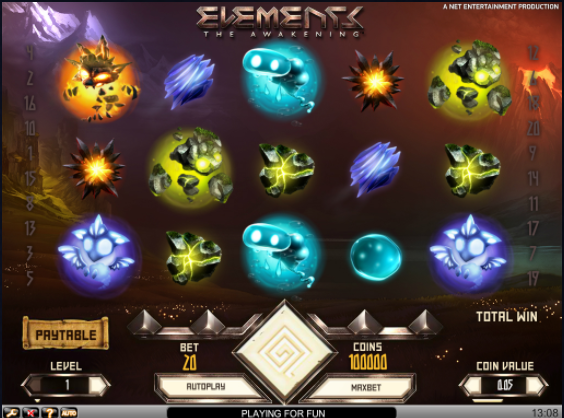 Elements is a fanatic outer space slot game with plenty to offer as it comes with a wide variety of extra features making a fun-filled game to play and enjoy for hours. Although the game is quite simple to play it’s far from boring and does a great job of keeping you engaged. The game features good graphics along with great sounds that fit the theme of the game well. RTP 96%. An equally enthralling game is our Enchanted Prince slot or For more information Click here.